Independent documentary films and short media have become an important voice for articulating the facts and stories that surround key issues. Philanthropists, foundations, corporate sponsors, and filmmakers alike know this to be true, but often can’t create an ecosystem of financial, strategic and tactical resources to drive social change. That’s where we step in. We identify projects that demonstrate high impact potential and an alignment with our vision. We create the structure, process and executed plan backed by tools and resources proven to unleash the most powerful impact possible. In collaboration with our past and present partners, we know that our film-centric approach can awaken and empower viewers to work collectively for positive social change. We invite you to join us in accelerating social change. Our donors’ generosity is central to the media impact campaigns we fund. A campaign that has a committed constituency can attract both foundation grants and corporate underwriting, the sum total of which can be leveraged to sustain and grow impact over time. In fact, our donors ensure the Fund’s ability to effectively and efficiently address the “Impact Gap” between an important documentary and one that can produce results. And of course, it is our donors whose contributions will make possible the breadth, depth, reach, and ultimately, the success of our work, translating our vision of sustainable tomorrows to reality. Donors to the Fund for Sustainable Tomorrows have a host of options. Foundations, philanthropists, and corporate sponsors can get involved by simply making a contribution that is directed to any one or more of the films on our project slate; they can simply leave it to us to direct the donation to a pressing need; or they can bring a new project to our attention and establish a relationship with us.. At the other end of the spectrum are our donor-directed projects. If there’s an issue or film about which you are passionate, the Fund can provide a level of “ownership” to create broad-reaching special programs, work directly with the filmmaker and producer, and even be acknowledged as an Executive Producer. Further, if there’s an issue that’s not on our current slate, a donation of $100,000 or more can be translated into a new program and added to our slate, with a special acknowledgement of your support. 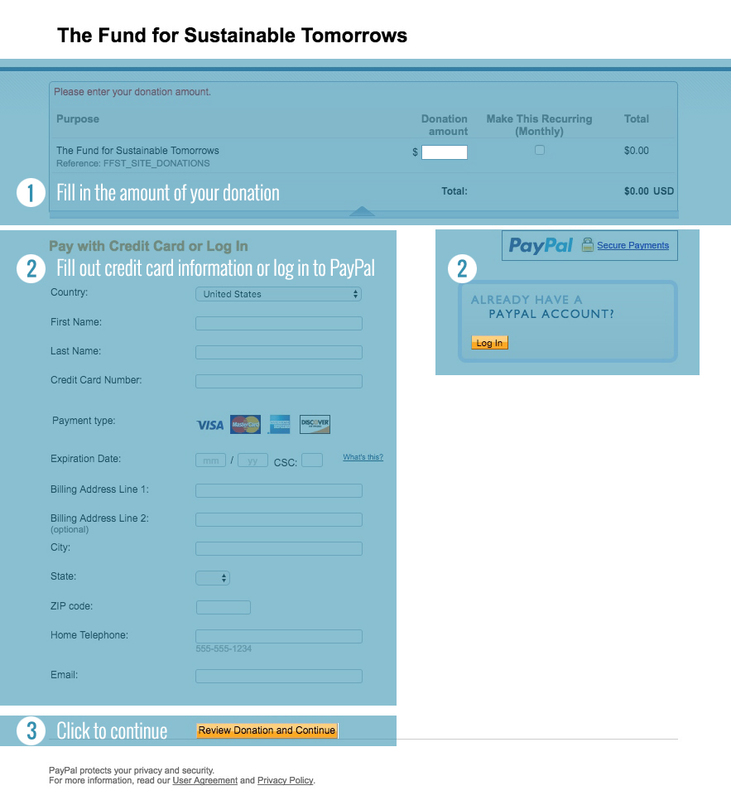 The Fund For Sustainable Tomorrows is a 501c3 non-profit organization. By joining with us, you can be part of a select group of individuals committed to supporting the acceleration of social change through the use of media. With your participation you become part of the solution and thereby, can be both effective and constructive in removing obstacles that stand in the way of impactful change. Help make media matter and consider donating to the Fund so that we may continue to bring you high-quality and engaging documentaries outside of the mainstream media outlets. Please select options of interest - selecting at least one option is required.